A bespoke Konecranes heavy truck, specified and supplied by Impact, has boosted productivity at specialist cleaning firm South Eastern Tanker Services (SETS) by 50 per cent by allowing containers to be stacked three-high for the first time. Impact worked with SETS to specify the Konecranes SMV 3 ECC 80, equipping the heavy truck with a specialised ELME 589TB spreader that allows SETS to stack three ISO tank containers and ISO dry freight containers on top of each other instead of a two-high stack that the business had used previously. This has significantly increased storage capacity and efficiency without increasing the footprint of the site. At the same time, the new equipment is able to safely manoeuvre under the road overpasses surrounding SETS’ Dagenham headquarters. The Impact-supplied truck joins an existing Konecranes unit at SETS, and is expected to handle more than 20,000 empty tankers annually, working six days a week. Purchased outright by SETS, the Konecranes truck was supplied with a supporting servicing agreement which will see the truck maintained by Impact’s manufacturer-trained technicians. 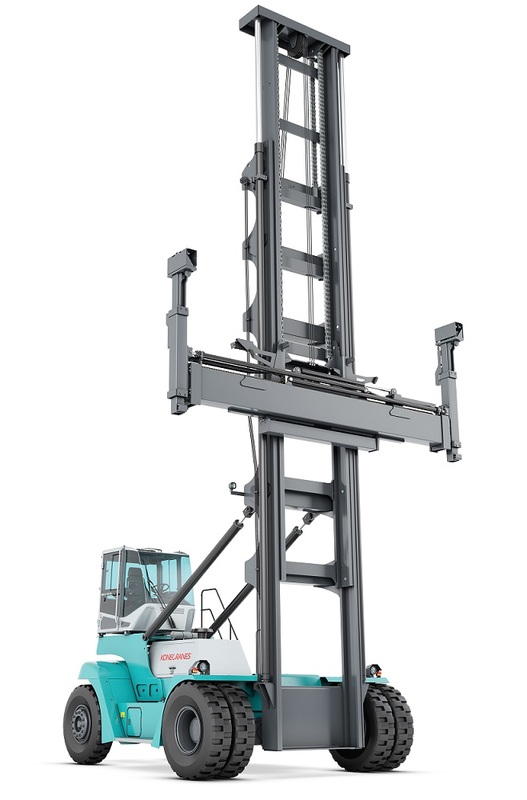 The Konecranes’ SMV 3 ECC 80 is one of an array of 8-10 tonne-lift models developed by the Finnish company and supplied by Impact, Konecranes Lift Trucks sole distribution partner in the UK and Ireland. SETS offers tanker cleaning, heating and repair services at its yard in Dagenham, which features two food bays and three non-food bays, catering for all container tanker cargoes. With the aim of boosting customer productivity, SETS has also developed a ‘drop and swap’ service, by which clients’ drivers can offload a dirty tanker container and load a cleaned replacement in a matter of minutes.